One of my favorite classic Italian dishes is Linguine and Clams, especially with red sauce. I'll settle with the white or cream sauce, but I definitely prefer the tomato based sauce. 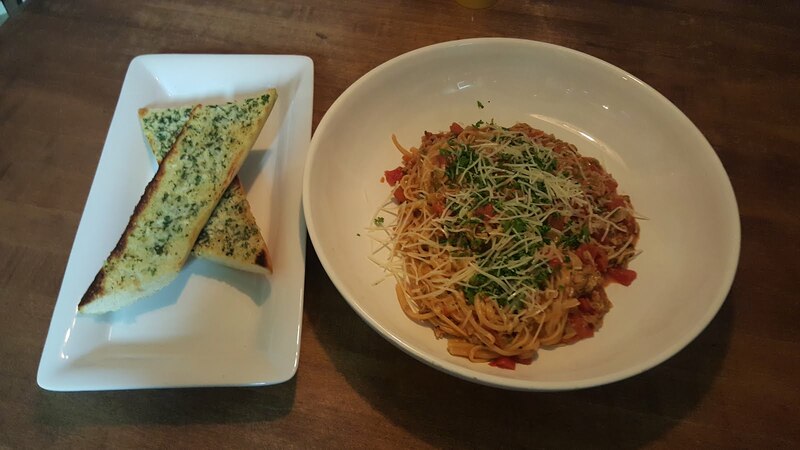 Linguine and Red Clam Sauce Served with Cheesy Garlic Bread. Sauté the garlic, shallot, crushed red pepper, salt, and pepper in the butter and olive oil. Add in the clams and tomatoes. Stir until heated. Add in the the lemon juice, chardonnay, and clam juice. Cook until the liquid reduces by half. Stir into linguine and garnish with chopped parsley. You can top the pasta with some freshly grated Parmesan cheese as well. Sometimes I like to get fancy and add some shrimp, scallops, or fresh clams. If you go this route, add them at the very end. They will cook very quickly. For the fresh clams, add a lid to the pan. Once the clams open, they are done.